Over the years, I have set to task on blogging about different subjects consistently or used the blog as my focus for a given project or challenge I've taken. I find this an incredibly useful aid for my self in determine my own understanding or sharing things that I am sorting out with others. At other times, the blog serves as a means for me to focus my energy to accomplish some larger goal. Some projects are ongoing; others happened and are now done. But part of the beauty of the blog is that the posts are still here for new people to discover. Several years ago, I decided to use the blog as a means to attempt something each year. I stumbled into this with my 365 Books challenge but have not found a way of continuing it throughout the years. I decided to pursue this after a January month where I managed to read over 31 books, audiobooks, and graphic novels. I realized that maybe I could try to read a book for every day of the year. I did. I made it to 400 actually. 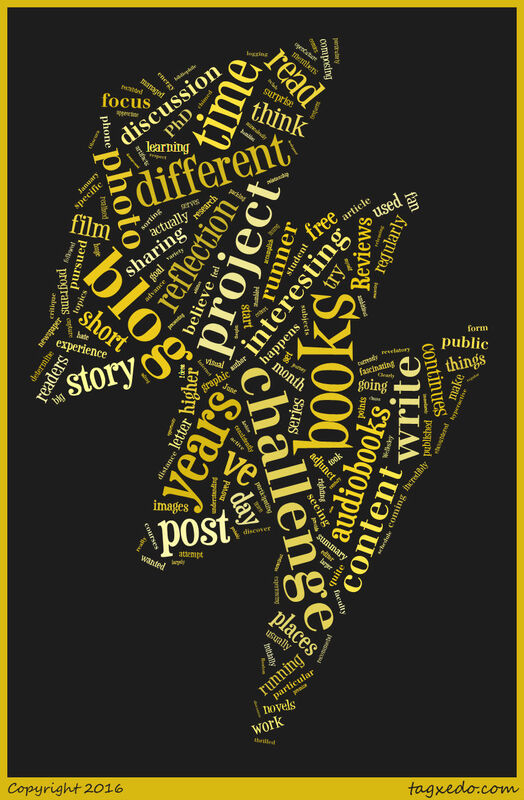 You can learn about my 365 Books A Year project by going through the posts and seeing what books I read. 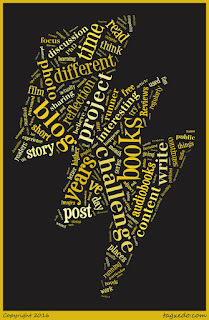 While the book project was ambitious, I believe the short-story project was more challenging. My goal was to read one short story a day and write a brief summary and my own review or critique of the story. I initially wanted to do it each day but found I had to start packing in the stories on free days and writing the blog posts in advance (or past due--ooops!). But I did get to 365 by year's end and currently, I am still writing about short stories but on a weekly basis now. I followed the short story challenge with a photo reflection challenge. I didn't actually make it to 365 because I made the promise to myself that I would do it within the day in which I took the photo (something I recanted on later in the year because of a busy schedule). I got to about 276 or so, which I was still happy about. I enjoyed the daily challenge to find something interesting to capture with my phone and then reflect on the photo. I recommend that everyone give a photo-reflection challenge a try at some point in their lives. This project started in August, 2016. (August 22 was the official launch, to be precise!). I don't have great drawing abilities. I never hard. But I do like to doodle and found myself drawing a series of stick people with different word balloons attached. I thought this could be a fun way of capturing another creative side of me or at least helping me do something creative even when there is not a lot of time to dive into story writing or other more taxing creative endeavors. I also found out that I could augment a recipe on IFTT so that I could post it to Instragram and it would generate a blog post, which was pretty cool to execute as well. In 2016, rather than doing a 365 project, I took on two 52 Challenges. The first was an article challenge. Since I've been in a PhD program, I decided that it would be interesting to start sharing some of the research that I have been coming across with readers. So I provide my own article summaries about different pieces of research. I know for some--they may find this a snooze. But I know others have chimed in saying that this has been quite fascinating for them. After the 365 Photos a Year project, I also wanted to continue with presenting and discussing visual content. I moved onto images though and in particular, older images that I encountered in a variety of placed. The first 2/3 of which are largely from the Wellesley student newspaper in the early 20th century, but covers other interesting visual artifacts from old publications elsewhere in the last third. Beyond the specific challenges that I have pursued over the years on the blog, there are also just some ongoing series that I regularly post to because they are things that I have an interest in or believe are of value to my readers. In 2011, I miraculously became a runner after 31 years, 10 months of a hate/hate-more relationship with running. It continues to be such a revelatory experience as I went from non-runner to active runner to hyperactive runner, participating in many races during the year to logging in well over 1000 miles a year. It's an amazing journey that still humbles me every time I think about it and thus, have spent many words thinking and reflecting on what running means to me. As we know, I'm a voracious reader of books, audiobooks, and graphic novels. As such, I do come across the occasional author that I'm really thrilled about. Sometimes, I'm just talking about their specific book while other times, I will get into their full range of work. Clearly, if there's one thing anyone can say this blog is about, it is probably books of one shape or form (you can see my full listing of reads on GoodReads). I am at heart a bibliophile. So to no one's surprise, I regularly write reviews for other places but I also take the time to write some for this blog as well. For those that don't know, I'm a HUGE audiobook fan (Big surprise, right?). I listen to hundreds of them a year and I am never far from one on my phone, in my car, or at my house. So usually in June, I'll write some posts on the topic of audiobooks since for those not in the know, June Is Audiobook Month! Who doesn't love free content? As a huge proponent of OER, I'm often on the look out for free content. I frequent places like OpenCulture and the Internet Archive quite often for their great and fascinating content. I'm also a fan of sites like Atlas Obscura and the Public Domain Review that pull out content from such places as focus points for discussion. (In fact, that may be a future series of my own). So over the years, I occasionally find an interesting niche of books, audiobooks, or even comics that I'll gather together into a post and share it out. I've always been a big film fan and on have even accumulated my top 100 films on this blog. In addition, I'll take the time to wax poetic about a particular film that I'm interested in or just find a good opportunity to discuss. Since I started my PhD in Higher Education at UMASS Boston, I've been blogging about my experience as I hit different markers or when I feel moved to think about what is going on in my learning. However, rather than post these immediately, they are set to be published one year after I compose them. My reasoning for this is to create some distance between composing and releasing since so much of what I'm experiencing is in the moment. I appreciate the delay because it gives me a reminder of where I've gone as well as give my cohort members and my professors some space and distance from the post. That's not to say that I write about them particularly (sometimes, it happens), but just to respect their own privacy of the classroom experience. Of course, since I also have been in higher education as a student, faculty, and staff member for the last 19 or so years, I tend to have different ideas and thoughts about it and regular post on topics that relate to what I see going on in the field. I've been an adjunct for ten years now and have taught over one hundred classes in fifteen different courses over those years. I've had the time to think about the work I do as an adjunct as well as work on programs for part-time faculty development as well. Together, it means I will occasionally reflect on what it means to teach among the disempowered majority in higher education. Because I believe in a strong public discourse, I regularly submit letters to the editor, though the newspaper is often seen as a dying form. Some of them I'm more proud than others but usually, I'm just righting from a place to try to push the discussion in a different way than what I'm seeing play out. Occasionally, I will also include a copy of the letter that never got published because I feel so compelled to make sure the ideas are out there.